This is a 45 years old African American woman who had lost about 60 lbs. with Lap Band Surgery. She was unhappy about still having “big arms.” Dr. Sean Younai who is a Board Certified Plastic Surgeon consulted with her about her treatment options for body contouring, more specifically about arm liposuction. 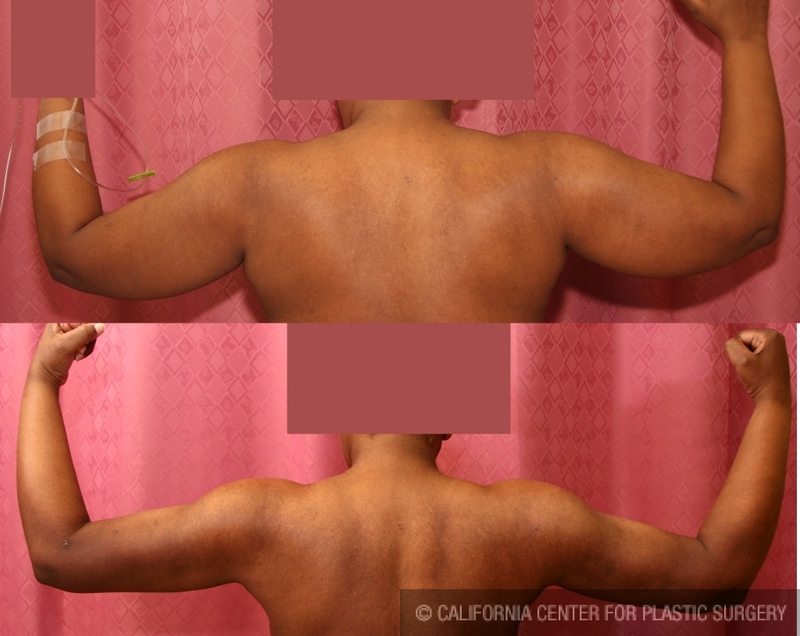 She underwent liposuction of her arms and outer chest at California Center for Plastic Surgery. Her recovery from liposuction was reasonably smooth and she was able to return to work in one week. After her liposuction she wore arm compression garment for three weeks at all times, and then for another three weeks, part time. During this time she was massaging her arms and was doing stretch exercises to help her healing. She started to exercises in ten days. Her arm liposuction before and after photos shown here was taken about three months after surgery. You can notice how much her arms circumference was reduced just with liposuction and without need for arm tuck or brachioplasty. You can also appreciate the beautiful arm definition that she had gained. Three months after recovering from her arm liposuction she underwent breast reduction and lift with Dr. Younai.